There remains a widely perceived notion — still commonly held within intellectual, academic, and policy circles in the West and elsewhere — that “Muslim” societies are especially resistant to embarking upon the path of demographic and familial change that has transformed population profiles in Europe, North America, and other “more developed” areas (un terminology). But such notions speak to a bygone era; they are utterly uninformed by the important new demographic realities that reflect today’s life patterns within the Arab world, and the greater Islamic world as well. Throughout the Ummah, or worldwide Muslim community, fertility levels are falling dramatically for countries and subnational populations — and traditional marriage patterns and living arrangements are undergoing tremendous change. 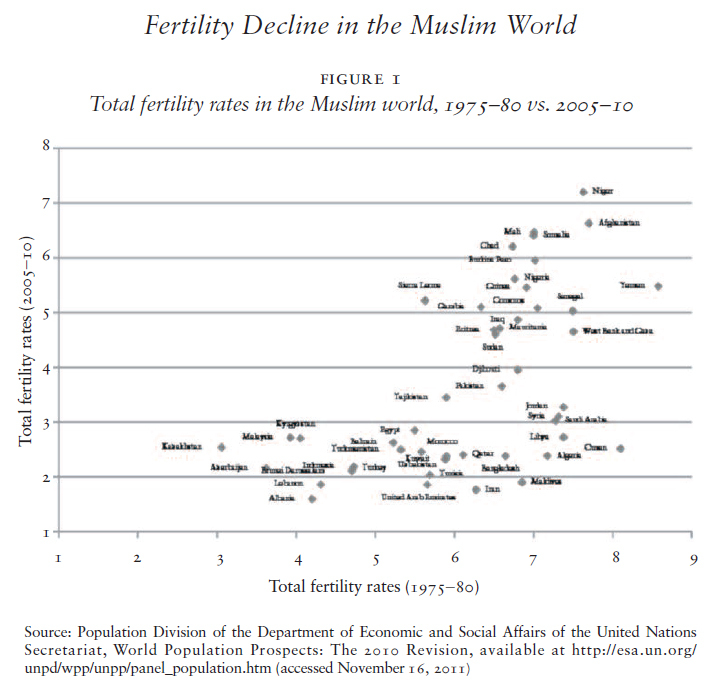 While these trends have not gone entirely unnoticed, no more than a handful of pioneering scholars and observers have as yet drawn attention to them and their potential significance.1 In this essay we will detail the dimensions of these changes in fertility patterns within the Muslim world, examine some of their correlates and possible determinants, and speculate about some of their implications. There is some inescapable imprecision to any estimates of the size and distribution of the Ummah — an uncertainty that turns in part on questions about the current size of some Muslim majority areas (e.g., Afghanistan, where as one U.S. official country study puts it, “no comprehensive census based upon systematically sound methods has ever been taken”), and in part on the intrinsic difficulty of determining the depth of a nominal believer’s religious faith, but more centrally on the crucial fact that many government statistical authorities do not collect information on the religious profession of their national populations. For example: While the United States maintains one of the world’s most extensive and developed national statistical systems, the American government expressly forbids the U.S. Census Bureau from surveying the American public about religious affiliation; the same is true in much of the eu, in the Russian Federation, and in other parts of the “more developed regions” with otherwise advanced data-gathering capabilities. Nevertheless, on the basis of local population census returns that do cover religion, demographic and health survey (dhs) reports where religious preference is included, and other allied data-sources, it is possible to piece together a reasonably accurate impression of the current size and distribution of the world’s Muslim population. Two separate efforts to estimate the size and spread of the Ummah result in reasonably consistent pictures of the current worldwide Muslim demography profile. The first, prepared by Todd M. Johnson of Gordon-Conwell Theological Seminary under the aegis of the World Christian Database, comes up with an estimate of 1.42 billion Muslims worldwide for the year 2005; by that reckoning, Muslims would account for about 22 percent of total world population. The second, prepared by a team of researchers for the Pew Forum on Religion and Public Life, placed the total global Muslim population circa 2009, a few years later, at roughly 1.57 billion, which would have been approximately 23 percent of the estimated population at the time. Although upwards of one fifth of the world’s population today is thereby estimated to be Muslim, a much smaller share of the population of the “more developed regions” adheres to Islam: perhaps just over three percent of that grouping (that is to say, around 40 million out of its total of 1.2 billion people). Thus the proportion of the world’s Muslims living in the less developed regions is not only overwhelming, but disproportionate: Well over a fourth of the population of the less developed regions — something close to 26 or 27 percent — would be Muslim, to go by these numbers. Most of the world’s Muslim population inhabits a tropical and semitropical expanse that stretches across Africa and Asia from the Atlantic shores of Mauritania and Morocco to the Pacific archipelagos of Indonesia and the Philippines. The great preponderance of the world’s Muslims live in Muslim-majority countries — 73 percent according to the World Christian Database, nearly 80 percent according to the Pew Forum study (which lists 49 countries and territories in Asia, Africa, and Europe that it identifies as Muslim-majority). Another tenth of the Ummah (roughly 160 million people as of 2009) lives within India, where Muslims are a religious minority. In all, eight countries today account for over 60 percent of the world’s Muslim population: Indonesia, Pakistan, India, Bangladesh, Egypt, Nigeria, Iran, and Turkey. Note that only one of these eight is an Arab society in the Middle East. 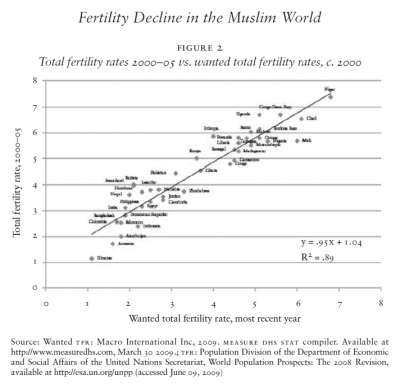 Since the overwhelming majority of today’s Muslims live in Muslim-majority countries, and since those same countries are typically overwhelmingly Muslim (by the Pew study’s estimate, 43 of those 49 countries and places are over two-thirds Muslim, 40 of them over 90 percent Muslim), we can use national-level data on fertility for Muslim-majority countries as a fairly serviceable proxy for examining changes in fertility patterns for the Muslim world community. For our purposes, the advantage here is that a number of authoritative institutions — most importantly, the United Nations Population Division (unpd) and the United States Census Bureau (uscb) — regularly estimate and project population trends for all the countries in the world. One way of considering the changes in fertility in these countries is to plot a 45-degree line across a chart and to compare fertility levels from three decades ago on one axis against recent fertility levels on the other axis. A country whose fertility level remains unchanged over time will remain exactly on this plotted line. If the fertility levels of the earlier time are plotted on the x-axis and the more current fertility levels on the y-axis, any country whose fertility level rises over time will be above the plotted line, whereas a country experiencing fertility decline will be located below the plotted line; the distance of these data points from the plotted line indicates the magnitude of a country’s absolute drop in fertility over these decades. The results from this exposition of data are displayed in Figure 1. As may be seen, according to unpd estimates and projections, all 48 Muslim-majority countries and territories witnessed fertility decline over the three decades under consideration. To be sure: For some high-fertility or extremely-high-fertility venues in sub-Saharan Africa, where tfrs (total fertility rates) in the six to eight range prevailed in the late 1970s, declines are believed to have been marginal (think of Sierra Leone, Mali, Somalia, and Niger). In other places where a fertility transition had already brought tfrs down around three by the late 1970s, subsequent absolute declines also appear to have been somewhat limited (think of Kazakhstan). In most of the rest of the Muslim-majority countries and territories, however, significant or dramatic reductions in fertility have been registered — and in many of these places, the drops in question have been truly extraordinary. With respect to absolute changes in tfrs, the population-weighted average for the grouping as a whole amounted to a drop of an estimated 2.6 births per woman between 1975 and 1980 and 2005 and 2010 — a markedly larger absolute decline than estimated for either the world as a whole (-1.3) or the less developed regions as a whole (-2.2) during those same years. Fully eighteen of these Muslim-majority places saw tfrs fall by three or more over those 30 years — with nine of them by four births per woman or more! In Oman, tfrs plummeted by an astonishing 5.6 births per woman during those 30 years: an average estimated pace of nearly 1.9 births per woman every decade. As for relative or proportional fertility declines, here again the record is striking. The estimated population-weighted average for the Muslim-majority areas as a whole was -41 percent over these three decades: by any historical benchmark, an exceptionally rapid tempo of sustained fertility decline. In aggregate, the proportional decline in fertility for Muslim-majority areas wasareas as a whole was -41 percent over these three decades: by any historical benchmark, an exceptionally rapid tempo of sustained fertility decline. In aggregate, the proportional decline in fertility for Muslim-majority areas was again greater than for the world as a whole over that same period (-33 percent) or for the less-developed regions as whole (-34 percent). Fully 22 Muslim-majority countries and territories were estimated to have undergone fertility declines of 50 percent or more during those three decades — ten of them by 60 percent or more. For both Iran and the Maldives, the declines in total fertility rates over those 30 years were estimated to exceed 70 percent. Given the differences in timing for the onset of sustained fertility declines in different settings around the world, it is possible for the above statistics to present a biased picture. It is possible to imagine, for example, that dramatic fertility declines might have taken place in other regions at earlier dates, with fertility declines tapering off during these years when the declines in the Muslim-majority areas were so manifestly dynamic: If that were the case, it would be possible to exaggerate the robustness of these Islamic fertility declines in comparison to other parts of the world. Yet while this is a theoretical possibility, empirical results do not corroborate such a contingency. Table 1 makes the point. Based on unpd’s estimates and projections of fertility patterns for all countries and territories for the entirety of the postwar era (1950 to 2010), it isolates the “top ten” fertility declines, as measured by both absolute and proportional change in tfrs, registered over any 20-year period. This approach will eliminate any “timing bias” from our selection of 1975 to 1980 and 2005 to 2010 as the period for which to analyze fertility declines. 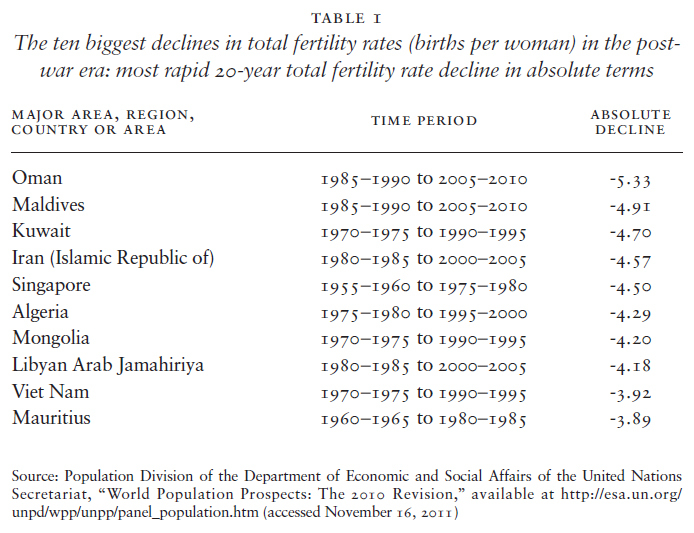 As may be seen in Table 1, six of the ten largest absolute declines in fertility for a two-decade period yet recorded in the postwar era (and by extension, we may suppose, ever to take place under orderly conditions in human history) have occurred in Muslim-majority countries. The four very largest of these absolute declines, furthermore, all happened in Muslim-majority countries — each of these entailing a decline of over 4.5 births per woman in just 20 years. (The world record-breaker here, Oman, is estimated to have seen its tfr fall by over 5.3 births per woman over just the last two decades: a drop of over 2.6 births per woman per decade.) Notably, four of the ten greatest fertility declines ever recorded in a 20-year period took place in the Arab world (Algeria, Libya, Kuwait, and Oman); adding in Iran, we see that five of these “top ten” unfolded in the greater Middle East. No other region of the world — not highly dynamic Southeast Asia, or even rapidly modernizing East Asia — comes close to this showing. When ranking the “top ten” historical fertility declines during any 20-year period by country in terms of proportional rather than absolute drops in tfrs, “only” four of the top ten fertility drops to date have occurred in Muslim-majority countries — and “only” two of the top four were Muslim-majority areas (Iran and the Maldives islands). 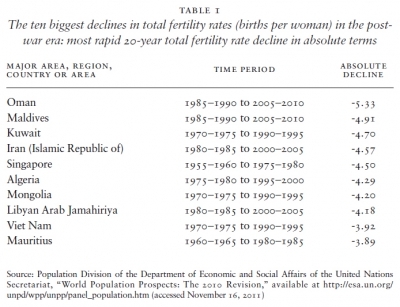 What may be especially noteworthy here, nonetheless, is that places like Kuwait, Oman, and Iran all effected fertility declines of over two-thirds in just 20 years — and that this pace of change exceeded the tempo of fertility decline in almost all of the Pacific Rim societies; the bric economies; and the other non-Muslim emerging market economies. 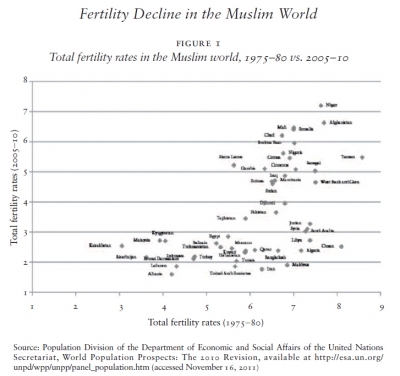 Given the extraordinary — indeed, as we have just seen, often historically unprecedented — fertility declines that a number of Muslim-majority populations have sustained over the past generation, it is now the case that a substantial share of the Ummah is accounted for by countries and territories with childbearing patterns comparable to those of contemporary, affluent, Western, non-Muslim populations. The low fertility levels for the Muslim-majority societies in question, it should be noted, have generally been achieved on substantially lower levels of income, education, urbanization, modern contraception utilization, and the like than those that characterize the more developed regions with which their fertility levels currently correspond today. We can highlight this point by comparing fertility in today’s Muslim-majority populations with that of the United States. America of course is not a “typical” oecd country in terms of its fertility level (quite the contrary, there is an unsettled argument among demographers today as to whether the U.S. exhibits “demographic exceptionalism”) — but as the leading developed society, comparisons with the United States can place Muslim-majority fertility patterns in a sort of “developmentalist” perspective. When contraposing unpd estimates or projections of fertility for diverse Muslim-majority countries and territories for the 2005 to 2010 period against those of the U.S. states and the District of Columbia for the year 2007, tfrs in a great many Muslim-majority populations look quite “American” these days. To go by unpd figures, for example, Algeria, Bangladesh, and Morocco all have fertility levels corresponding to the state of Texas, while Indonesia’s is almost identical to Arkansas’s. Turkey and Azerbaijan, for their part, are on par with Louisiana, while the tfr in Tunisia looks like that in Illinois. Lebanon’s fertility level is lower than New York State’s. As for Iran, its fertility level today is comparable with those of the New England states, the region in America with the lowest fertility. No state in the contemporary U.S., however, has a fertility level as low as Albania’s. All in all, according to these unpd figures, 21 Muslim-majority populations would seem to have fertility levels these days that would be unexceptional for states in the U.S. (with the possible exception of Albania, whose fertility level might arguably look too low to be truly “American”). As of 2009, these 21 countries and territories encompassed a total estimated population of almost 750 million persons: which is to say, very nearly half of the total population of the Ummah. These numbers, remember, exclude hundreds of millions of Muslims in countries where Islam is not the predominant religion. Taking this into account, it could well be that a majority of the world’s Muslims already live in countries where their fertility levels would look entirely unexceptional in an American mirror. To be sure — just as fertility varies among the 50 American states, so it differs by region in many predominantly Muslim societies. But such geographic differences further emphasize the extent to which fertility levels for a great portion of the Ummah has come to correspond with levels taken for granted nowadays in more-developed, non-Islamic Western societies. In Turkey, fertility levels were comparable to Hawaii; even in south Turkey, fertility levels were just about the same as in Nebraska. Let us take the example of Turkey. For the period 2000/2003, according to a Turkish dhs, the country’s overall tfr was 2.23. That average, however, was strongly influenced by the distinctively high fertility levels of eastern Turkey (a largely Kurdish region), where a tfr of 3.65 was recorded. In much of Turkey, tfrs of 1.9 or less prevailed. Istanbul’s tfr, for instance, was less than 1.9 — which is to say, it would have been equivalent to the corresponding level for France in those same years. Placed in an American perspective, eastern Turkey’s fertility levels are off the scale — but for Turkey as a whole, fertility levels were comparable to Hawaii, and even for comparatively fecund south Turkey, fertility levels were just about the same as in Nebraska. For their part, if north Turkey, west Turkey, central Turkey, and Istanbul had been part of the U.S., they would have qualified as low-fertility states. Only six of America’s 50 states, for example, had lower fertility than Istanbul around that time. Consider next the case of Iran. As we have seen, over the past generation Iran has registered one of the most rapid and pronounced fertility declines ever recorded. By 2000, according to Iran’s dhs of that same year, the tfr for the country as a whole had dropped to 2.0, below the notional replacement level of 2.1. But there were also great regional variations within Iran, with some areas (such as the largely Baluchi provinces of Sistan and Baluchistan in the east and the largely Kurdish West Azerbaijan province in the west) well above replacement, and much of the rest of the country far below replacement. Note in particular that Tehran and Isfahan reported fertility levels lower than any state in the U.S. With a tfr of 1.4, indeed, Tehran’s fertility level in 2000 would have been below the average for the eu-27 for 2002 (tfr 1.45), well below 2000 fertility in such places as Portugal (1.54) and Sweden (1.54), and only slightly higher than such famously low-fertility European countries as Italy (1.26) and Germany (1.38). Admittedly, our use of the U.S. as a comparator for fertility levels in Muslim-majority areas perforce excludes the tremendous swath of the present-day Ummah where fertility levels are (at least for now) higher than in present-day America. The point of our selection, however, is to emphasize just how very much of the Ummah can be included in such a comparison nowadays. This is a very new development: 30 years ago, barely any Muslim-majority country or territory would have registered fertility levels low enough to permit approximate comparison to corresponding fertility levels in any U.S. state. As of 1977, period tfrs for Utah, always America’s most fertile state, were just under 3.6, while according to unpd estimates the very lowest tfrs in the late 1970s for any Muslim-majority populations would have been for Kazakhstan (3.1) and Azerbaijan (3.6). Thus in just 30 years, the total population of Muslim-majority areas whose fertility levels could be reflected in a contemporaneous American mirror has thus risen from under 20 million to nearly three quarters of a billion. By any benchmark, this qualifies as a remarkable change. How is the extraordinary demographic transformation described here to be accounted for? Typically, demographers and other social scientists in our era attempt to explain fertility changes in terms of the socioeconomic trends that drive (or at least accompany) them. 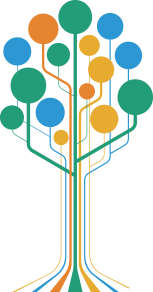 We can presume to examine some of the correspondences between socioeconomic trends and fertility change through analysis at the national level for Muslim-majority states, given the wealth of national-level socioeconomic statistics that have been collected by government statistical authorities, the United Nations, the World Bank, and other agencies and institutions. We know, of course, that the 48 Muslim-majority countries and territories for which the unpd provides demographic estimates encompass a rich diversity of national histories, cultures, languages, and specific traditions. But if we analyze this collectivity as a single group — in other words, as if there were something distinctive about Muslim-majority countries per se — we can conduct a preliminary inventory of readily apparent broad socioeconomic associations with fertility change for this, the lion’s share of the population of the contemporary Ummah. Social science research strongly suggests that contemporary Muslim societies are distinctive from non-Muslim societies in a number of other behavioral respects: Does this distinctiveness also obtain with patterns of fertility and fertility change? A century of social science research has detailed the historical and international associations between fertility decline and socioeconomic modernization (as represented by increasing income levels, educational attainment, urbanization, public health conditions, and the like). Those associations, not surprisingly, are immediately evident in simple cross-country correlations between national fertility levels and these respective socioeconomic variables, using data for the less-developed regions circa 2005. For the less developed regions as a whole, fertility levels tend to decline across countries with greater urbanization, per capita income, female literacy, utilization of modern contraceptive methods, and infant survival prospects — with associations between those fertility changes and those different socioeconomic variables lowest for urbanization and highest for infant mortality (simple r-squares from 0.33 to 0.75). 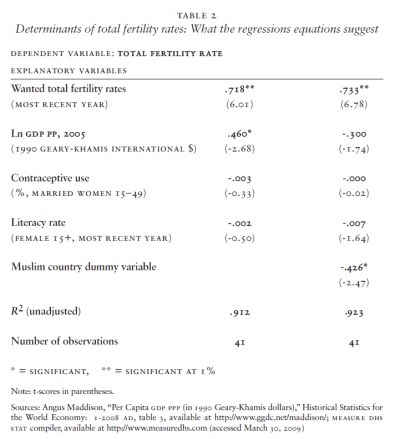 For female literacy, modern contraceptive use, per capita income, and infant mortality, the simple coefficients of determination (r-squares) with fertility levels for countries in the less-developed regions all exceed 60 percent; put another way, each of these factors by itself tracks with 60 percent or more of the difference in fertility levels between countries around the year 2005. Clearly, those are very robust associations, considering all the particularities and unique characteristics that necessarily distinguish any country from all others. But just as clearly, these broad associations between fertility change and material measures of modernization or socioeconomic development are not the whole story here. Nearly two decades ago, a path-breaking study by Lant Pritchett, “Desired fertility and the impact of population policies,” made the case that desired fertility levels (as expressed by women of childbearing age in dhs surveys) were the single best predictor for actual fertility levels in the less developed regions. Sure enough, as Figure 2 demonstrates, dhs surveys conducted since that study reveal a 90 percent association between wanted fertility and actual fertility levels in the 41 less-developed countries for which such recent data were available. This finding still flies in the face of much received opinion in population policy circles. In particular, it seems to challenge the notion that family planning programs, by encouraging the prevalence of modern contraceptive use, may make an important independent contribution to reducing fertility levels in developing countries, especially by reducing what is called “excess fertility” or “unwanted fertility.” It has often been difficult to test that proposition in a methodologically sound and rigorous manner, as the aforementioned Pritchett study observed — and as Pritchett himself argued, methodologically sound investigations seemed to suggest that the demographic impact of family planning programs tended to be marginal. Preliminary analysis of more recent dhs surveys would seem to corroborate Pritchett’s findings. In reviewing the correspondence in recent dhs surveys between “excess fertility” (defined here as the difference between actual fertility levels and reported levels of desired fertility) and the prevalence of modern contraceptive use, we find no observable correspondence whatsoever between these two factors. Socioeconomic forces, to be sure, may well affect the desired family sizes that women of childbearing ages report in these dhs surveys — in fact they surely do. But the critical determinant of actual fertility levels in Muslim and non-Muslim societies alike at the end of the day would appear to be attitudinal and volitional, rather than material and mechanistic. How do the various factors mentioned thus far interact in influencing fertility levels in Muslim-majority countries? We may get a sense of this complex interplay from the hints offered by an initial multivariate analysis of international fertility difference reported in recent dhs surveys. 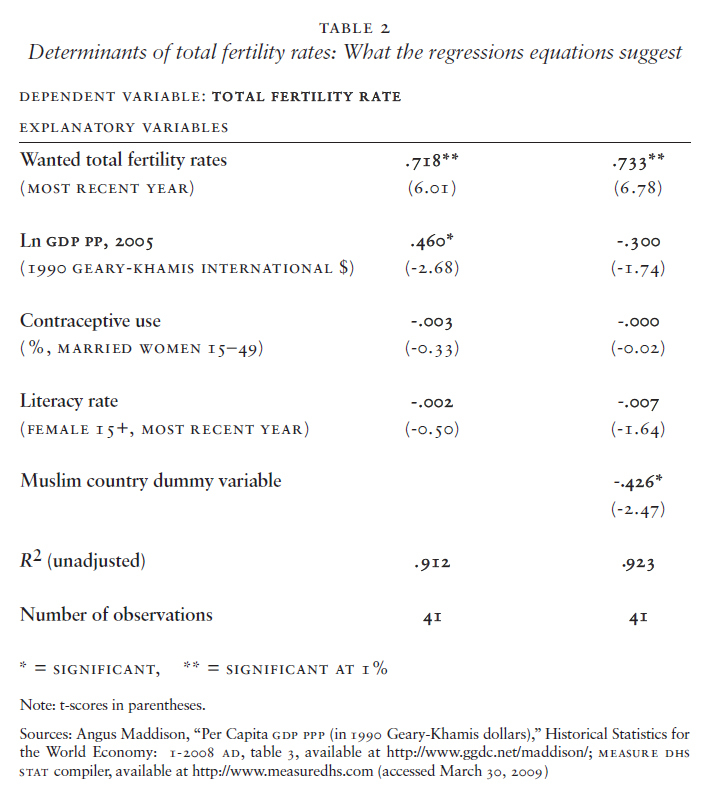 The first regression equation in Figure 3 attempts to “predict” fertility levels in 41 Muslim and non-Muslim less-developed countries on the basis of per capita income, literacy rates, prevalence of modern contraceptive use, and desired fertility. Taken together, changes in these four variables can be associated with over 90 percent of the differences in fertility levels in this sample of countries. For this sample of countries, however, only two of these variables emerge as meaningful (“statistically significant”): desired fertility and per capita income. Interestingly enough, the literacy and contraceptive use variables in this regression were not only statistically insignificant, but each came out with calculated coefficient values not appreciably different from zero. The second equation adds an additional factor to the regression for predicting fertility levels: a dummy variable for Muslim-majority population. Introducing this variable changes the results in an intriguing way: Now per capita income loses its statistical significance (if barely) so that only desired fertility retains its statistical significance out of the original four independent variables from the first equation. But the dummy variable for Muslim-majority in this second equation is statistically significant: And perhaps surprisingly, the value of this variable is negative. This is to suggest that, at any given level of per capita income, literacy, and contraceptive use, Muslim-majority societies today can be expected to have fewer children than their counterparts in non-Muslim societies nowadays! People in the Ummah can be expected, today, to have fewer children than people in non- Muslim societies. Why should this be so? “Developmentalist” theories, with their emphasis on the primacy of material and structural transformations, cannot offer much insight into this mystery. Nor would it seem that what might be called the “contraceptivist” theories favored by those who see family planning policies as a major instrumental factor in eliciting fertility decline in less developed regions. Although Muslim-majority countries, as we have seen, apparently tend to have substantially lower fertility levels nowadays than non-Muslim comparators when holding income, literacy, contraceptive use, and desired fertility constant, Muslim-majority countries also tend to have significantly lower levels of modern contraception use than non-Muslim countries at the same income levels. Holding income constant, modern contraception usage was approximately fourteen percentage points lower in Muslim than in non-Muslim majority societies in the 1980s, and remained eleven percentage points lower 20 years later. Despite such characteristically more limited use of modern contraception, the pervasive, dramatic, and in some cases historically unprecedented declines in fertility highlighted earlier in this chapter took place nonetheless. Much more research is warranted to glean a greater understanding of the social, economic and other factors involved in the ongoing transformation of fertility levels and family patterns within the Ummah today. What we would simply wish to emphasize at this point is the critical role human agency appears to have played in this transformation. “Developmentalist” perspectives cannot explain the great changes underway in many of these countries and territories — in fact, various metrics of socioeconomic modernization serve as much poorer predictors of fertility change for Muslim-majority populations than for non-Muslim populations. Not to put too fine a point on it: Proponents of “developmentalism” are confronted by the awkward fact that fertility decline over the past generation has been more rapid in the Arab states than virtually anywhere else on earth — while well-informed observers lament the exceptionally poor development record of the Arab countries over that very period. By the same token, contraceptive prevalence has only limited statistical power in explaining fertility differentials for Muslim-majority populations — and can do nothing to explain the highly inconvenient fact that use of modern contraceptives remains much lower among Muslim-majority populations than among non-Muslim societies of similar income level, despite the tremendous fertility declines recorded in the former over the past generation. Put another way: Materialist theories would appear to come up short when pressed to account for the dimensions of fertility change registered in large parts of the Ummah over the past generation. An approach that focuses on parental attitudes and desires, their role in affecting behavior that results in achieved family size, and the manner in which attitudes about desired family size can change with or without marked socioeconomic change may prove more fruitful here. We have made the empirical case here that a sea change in fertility levels, and by extension, in attendant patterns of family formation, is now underway in the Islamic world — even if this sea-change remains curiously unrecognized and undiscussed even in the societies it is so rapidly transforming. Why this should be the case is an important question, but one that will not detain us here. Instead, we shall conclude by touching a few of the more obvious implications of these big demographic changes for the years ahead. Downward revision of population projections. In its 2000 revisions of World Population Prospects, unpd “medium variant” projections envisioned a population for Yemen of 102 million people; in its 2010 revisions, the 2050 “medium variant” projection for Yemen is 62 million (uscb projections for Yemen for 2050 as of this writing are even lower: under 48 million). Unanticipated but extremely rapid fertility declines would likewise militate for downward revisions in the trajectory of future demographic growth in other Muslim-majority areas. Coming declines in working-age (15-64) population. If the current prospect for Muslim-majority countries and territories entails coping with the challenges of finding employment for continuing and even increasing increments of working age manpower, in the foreseeable future an increasing number of Muslim-majority countries may face the prospect of coping with manpower declines. If current uscb projections prove accurate, Lebanon’s fifteen to 64 cohort would peak in the 2023 and would shrink more or less indefinitely thereafter. 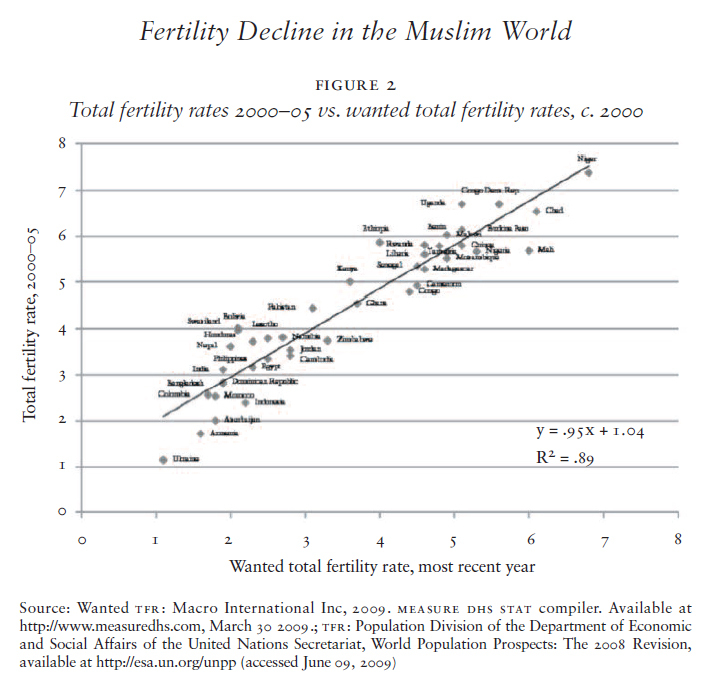 On the trajectories traced out by current uscb projections, another thirteen Muslim-majority countries would also see their conventionally defined working-age populations peak, and begin to decline, before 2050.3 Over the past generation, we should remember, demographic authorities for the most part underestimated the pace and scale of fertility decline in Muslim regions — sometimes very seriously. If underestimation is still the characteristic error in fertility projections for these populations, this would mean that manpower declines would commence earlier than envisioned for the countries in question — and that additional countries and territories might experience workforce decline before 2050. A wave of “youthquakes.” With rapidly declining fertility rates, the arithmetic of population composition makes for inescapable youthquakes: temporary, but sometimes very substantial, increases in the fraction of young people (say, aged fifteen to 24 or 20 to 29) as a proportion of total population. Depending on the social, economic, and political context, such youthquakes can facilitate rapid economic development — or can instead exacerbate social and political strains. Tunisia passed through such a youthquake some time ago, and Iran is experiencing the tail end of one today; Yemen and Palestine, among other Muslim-majority societies, have yet to deal with theirs. Rapid population aging on relatively low income levels. The lower a country or territory’s fertility, the more powerful the demographic pressure for population aging over the subsequent generation. With extremely rapid fertility decline — and the descent into sub-replacement fertility — a number of Muslim-majority populations are already set on course for very rapid population aging. Over a dozen Muslim-majority populations, under current uscb projections, would have higher fractions of their national populations over the age of 65 by 2040 than the U.S. today. Today these same places enjoy only a fraction of U.S. per capita income levels; even with optimistic assumptions about economic growth, it is hard to envision how they might attain contemporary oecd income levels — much less contemporary oecd educational profiles or knowledge-generation capabilities — by the time they reach contemporary oecd aging profiles. How these societies will meet the needs of their graying populations on relatively low income levels may prove to be one of the more surprising and unanticipated challenges of the fertility revolution now underway in the Ummah. The remarkable fertility declines now unfolding throughout the Muslim world is one of the most important demographic developments in our era. Yet it has been “hiding in plain sight” — that is to say, it has somehow gone unrecognized and overlooked by all but a handful of observers, even by specialists in the realm of population studies. Needless to say, such an oversight is more than passing strange, and we do not propose to account for it here. Preconceptions about the nature of “Muslim society” and “Muslim family values” may or may not help explain why these dramatic developments have come as such a surprise to so many otherwise well-informed students of the international scene. By the same token, the essentially “frozen” nature of politics in so many Muslim-majority countries over the past generation (at least until the Arab Spring) may or may not have encouraged in many quarters the unwarranted presumption that rhythms of life beneath these seemingly unchanging Muslim-world autocracies were unchanging as well. Whatever the case may be, the great and still ongoing declines in fertility that are sweeping through the Muslim world most assuredly qualify as a “revolution” — a quiet revolution, to be sure — but a revolution in which hundreds of millions of adults are already participating: and one which stands to transform the future. Nicholas Eberstadt holds the Henry Wendt chair in political economy at the American Enterprise Institute, where Apoorva Shah served as research fellow. They would like to offer thanks to Kelly Matush of AEI for her assistance in preparing this paper, and also to Heesu Kim, Mark Seraydarian, and Daksha Shakya, Mauro De Lorenzo, and Philip I. Levy for their help and suggestions. 1 Two works in particular may be saluted in this regard: Youssef Courbage and Emmanuel Todd’s A Convergence of Civilizations: The Transformation of Muslim Societies Around The World (Columbia University Press, 2011), and David P. Goldman’s How Civilizations Die (And Why Islam Is Dying Too) (Regnery, 2011). The former is a translation of a 2007 study by two noted French demographers; the latter, a wide-ranging and provocative exposition by an American public intellectual. Neither work has to date received the readership it deserves. 2 he unpd does not offer estimates for Kosovo — and while the uscb does calculate current demographic trends for that country, its estimates do not extend back to the 1970s. Note that that unpd calculates “period tfrs” rather than “cohort tfrs” — that is to say “snapshot” or synthetic estimates of fertility, as if a woman completed her childbearing on the schedules for women of all childbearing ages at that time, rather than actual completed childbearing patterns for women from given birth years or cohorts. While there can be important differences between period and cohort estimates of tfr, this matter will not detain us here. 3 These countries are Algeria, Azerbaijan, Indonesia, Iran, Kazakhstan, the Maldives, Morocco, Qatar, Tunisia, Turkey, Turkmenistan, the United Arab Emirates, and Uzbekistan.